LOS ANGELES SOUND BATH Ambient Music for Relaxation, Meditation, Yoga & Wellness. The new album from Dynasty Electrik, dives deeply into the world of sound healing and ambient music. Crystal singing bowls, theremin, synthesizers, piano, guitar, vocals and nature sounds, weave together an entrancing soundscape that takes the listener on a journey designed for relaxation, meditation, and inner visionary experience. Dynasty Electrik is the musical duo of Jennifer Deveau (voice, theremin, singing bowls) and Seth Misterka (keyboards, guitar, sax, flute, electronics, vocals, gong, and singing bowls). After a decade of playing in the Brooklyn underground rock scene, touring and writing music for television and film, they met Lisa Ishwari Murphy, a sound healer with whom they studied, and they began incorporating some of the instruments and intentions of sound healing into their work. They embarked on a cross-country journey from Brooklyn to Los Angeles with extended stays in the mountains of North Carolina and beaches of Baja California, Mexico. When they landed in Los Angeles, they began sharing their new music for yoga classes and their new sound bath was born. The group began a Friday night residency to packed crowds at Mystic Journey Crystals in Venice. The diverse and eclectic audience of all ages often includes celebrities among those seeking rest and relief from the stress of city life. Now, the experience of “Los Angeles Sound Bath” can be enjoyed on-line at anytime. It is a perfect compliment to yoga, meditation, and relaxation and it will take the listener on a trip into the worlds of new age, classical and ambient music along with elements of electronic, trance and trip-hop. At times, the album feels like a psychedelic experience (without the side effects). 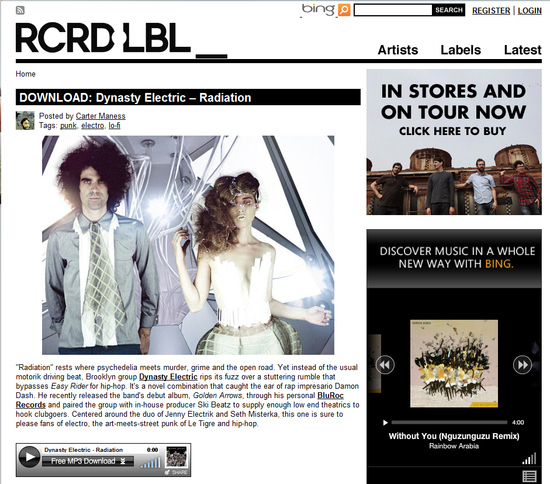 With their unique look and sound, Dynasty Electrik are the new rock stars of sound healing. Magnetic Magazine Interview– In what appears to be a seemingly mellowed-out, more conservative change for the group is actually innovation to the nth degree. Drawing from a discography perfectly seasoned with indie-dance, house, psych-rock and folk elements, particularly in today’s genre-bending electro-landscape, Dynasty Electrik have once again risen to the top with their latest, Crystal Sound Bath. More than an album, it’s an incredible experience. 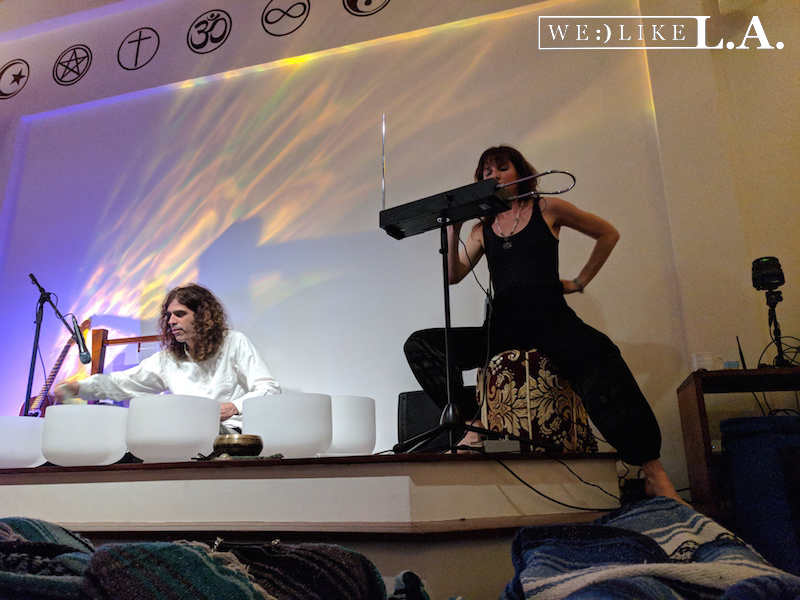 Jenny Deveau’s soothing voice, coupled with Seth Misterka’s strong presence onstage, put us in the perfect state of mind to begin their Dynasty Electrik crystal sound bath. Sound baths are not a new experience for me; I often use the vibrational powers of sound and tones to cleanse my spirit of any negative frequencies passing through. But the gift Misterka and Deveau gave to me by introducing my ears to crystal sound bowls was unlike anything I’ve experienced with the more commonly used metal bowls. Their crystal bowls took me to a place where I was floating and grounded, all at the same time. 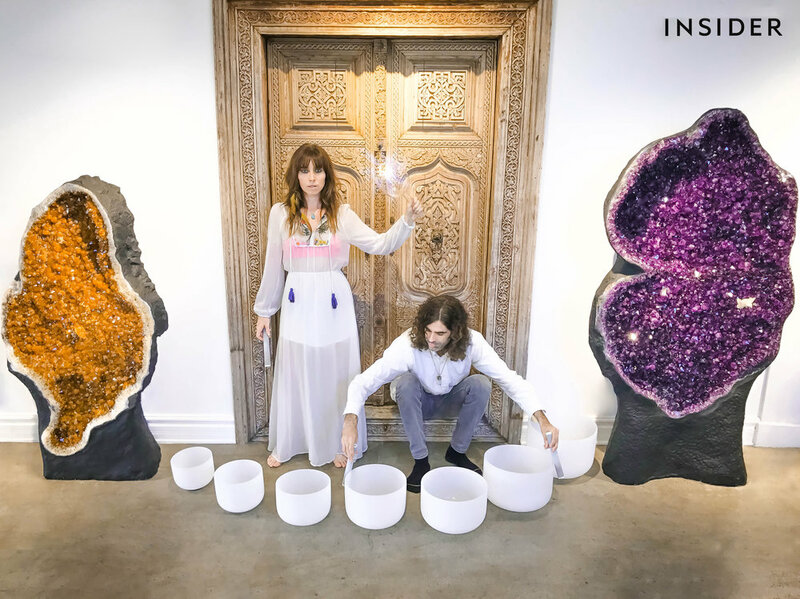 ThisInsider.com -Discover LA– It doesn’t get any more LA than finding your way into a Dynasty Electrik Crystal Sound Bath Session at Mystic Journey Crystals. Jenny Deveau and Seth Misterka , the duo behind Dynasty Electrik, use traditional sound healing instruments like singing bowls and gongs, along with the theremin, to take participants on an internal journey. If it sounds trippy, you know your in the right place. Arrive early for the session to grab some lumbar supporting cushions or better yet bring your own blanket. Playing amongst the crystals on a Friday night at Mystic Journey on Lincoln Boulevard in Venice, Seth Misterka and Jenny Deveau of Dynasty Electrik, take locals on a sonic healing and restorative journey. With the release of their new album “Crystal Sound Bath”, the electric duo send their music to the world incorporating DJ elements and live instruments to create a unique fusion of electronic music and psychedelic experience. Whether performing live at Mystic Journey or recording for a wider audience, the duo draws upon their years of spiritual and musical experience to create a magical collaboration. Los Angeles musical duo Dynasty Electrik have produced a new composition to accompany “Emerge From the Fog”, a crystal and herbal bath infusion from Bath Brew by Hellen NYC. The music is a 22 minute journey into the world of celestial sound featuring piano, crystal bowls, gong, voice, theremin, ambient electronic music and the sounds of nature. The bath features a mixture of salts, pimenta berry oil, and cornflower with lapis and clear quartz. Together, the bath and music are a perfect way to relax, rejuvenate, and create a sense of clarity, balance, and harmony. Dynasty Electrik (aka Dynasty Electric) incorporates electronic music and live instruments to create a unique fusion of styles ranging from psychedelic pop and rock to hip hop and sound healing. The group has earned critical praise, had their music featured in television and film, and toured the world. 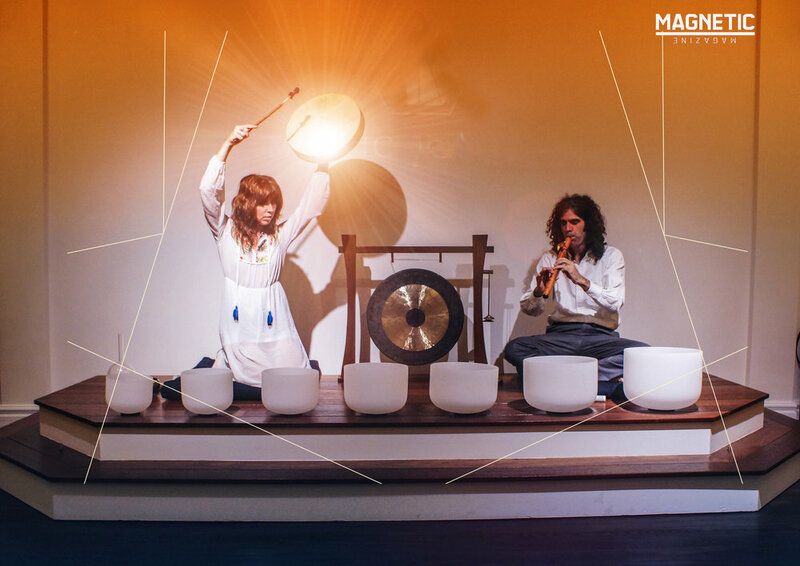 Their most recent creation, “Los Angeles Sound Bath” features traditional sound healing instruments including singing bowls, gongs and nature sounds, along with electronic tones and theremin. The vibrational power of sound has the ability to transport the listener to a state of deep meditation and relaxation where the chakras are balanced and the energetic body is harmonized. In 2009, they caught the attention of hip-hop impresario Damon Dash who paired them with producer Ski Beatz for their album “Golden Arrows”. The album received critical acclaim and the lead track was placed in a commercial for Victoria’s Secret. Additionally the group opened for alt-rock legends The Meat Puppets on their U.S. tour. 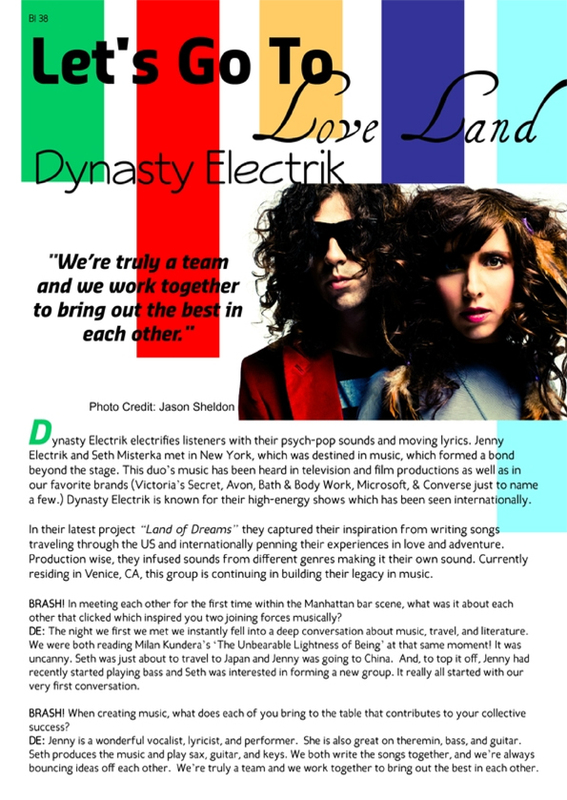 The band signed was signed to an indie label deal with NS in 2011 and worked with award winning producers David Maurice, DJ Logic, and Ski Beatz for their follow up record “Dynasty Electric”. The lead single “Eye Wide Open” aired on MTV2 and was later licensed for a Bath & Bodyworks commercial. The group opened for artists such as Paul Oakenfold, Passion Pit and GirlTalk while on tour. The group worked with Indaba Music on their 2014 album “Euphoria”, soliciting remixes from producers around the world. The lead single “Supersonic” was licensed for the Microsoft Surface. In 2015 they lived in the mountains of North Carolina producing the EP “A Million Words of Love” with the single “Om Shiva” and sound healing recordings for Master Energy Medicine Practitioner Lisa Ishwari Murphy. Their most recent pop album “Land of Dreams” was released in 2017 and features the lead single “Star”. It was produced in New York City, the mountains of North Carolina, San José del Cabo, Mexico, and Los Angeles, California. They are currently located in Los Angeles, CA, where they perform meditational music at yoga classes and sound baths. They have released 2 albums of sound bath music: Crystal Sound Bath (2018) and Los Angeles Sound Bath (2019). They are both practitioners of yoga, meditation and vegetarianism. They are firmly committed to peace, love, compassion, and equal rights.